Come and visit the first and only Bigfoot Museum and Research Center in Nebraska! Meet "Patty", "Sassy" and Harriett (the Bigfoot Lady). Admire all the Bigfoot exhibits - a 60 year collection of artifacts. Learn and be educated about Sasquatch and the research into this elusive creature here in the Midwest. Hear stories and testimonies from the Bigfoot Museum & Research Center owner, Harriett McFeely. Harriett's main goal is to bring further knowledge and appreciation of this unique species to all Bigfoot believers and non-believers. Since Hastings is located in central Nebraska, along the I-80 and Hwy 281 intersection - she created Nebraska Bigfoot Crossroads of America. 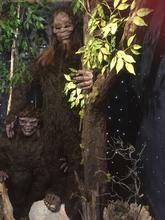 Harriett's dream as an eight year old little girl was to follow Bigfoot, enjoy adventures, educate others, and have a Bigfoot museum full of exhibits for people all over the United States to come and visit. Her dream has now become a reality! ** A perfect field-trip or outing for schools, organizations, Boy and Girls Scouts, groups, etc. - Visit the "Bone Room" and "Patty & Sassy's Home"
- Hear authentic Bigfoot "talking"
** Gift Shop - coming soon!